I’m a second-generation Junior League member, so I can easily see how our members dedication for service and generosity rubs off on their children. Here are a few recent examples of kindness that we had to share and some tips on how you can inspire giving with your families! 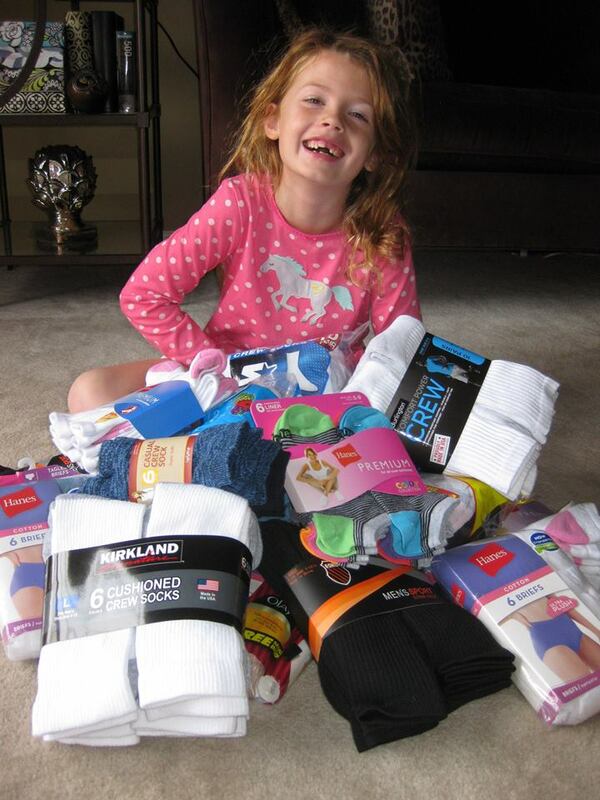 At a recent holiday party, Jessica Peltzer’s daughters got in the holiday spirit by asking their friends to bring new socks and underwear for Lazarus Ministry. 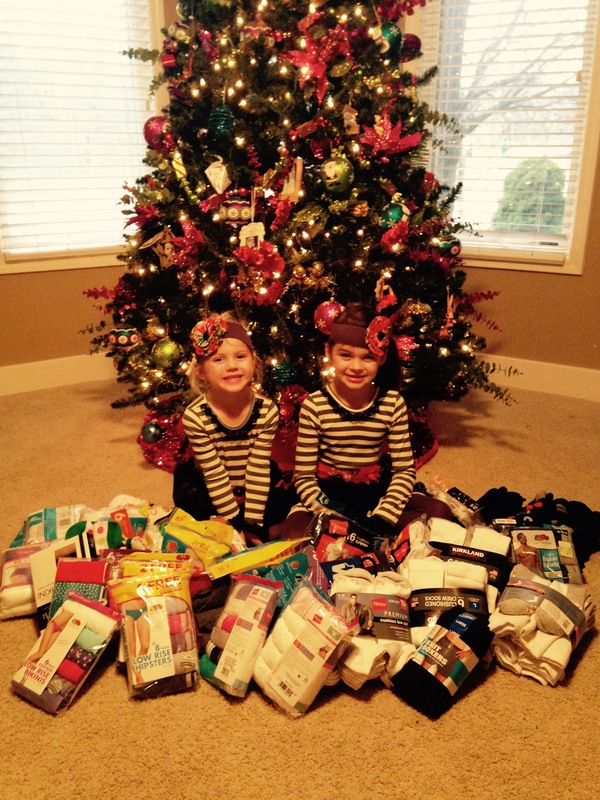 They were amazed at the result as they collected 186 pairs of socks and 67 pairs of underwear. With over 253 items donated, these two girls were able to have a big impact for the shelter residents at Lazarus Ministry. Earlier this fall, Kori Crouse’s daughter asked guests to bring socks and underwear instead of presents to her Frozen themed birthday party. 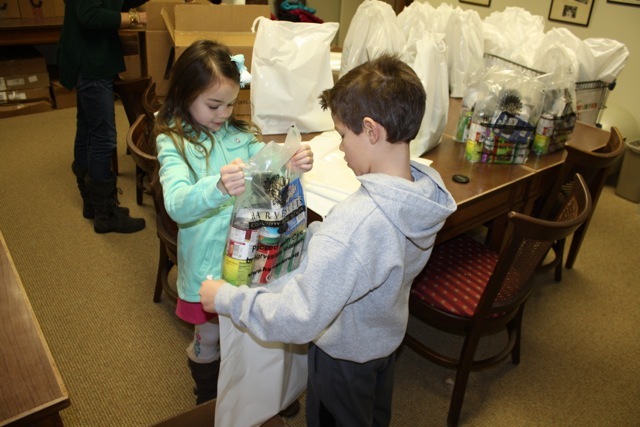 Seven-year-olds are never too young to help, and the eight guests helped her gather over 100 items for Lazarus Ministry. 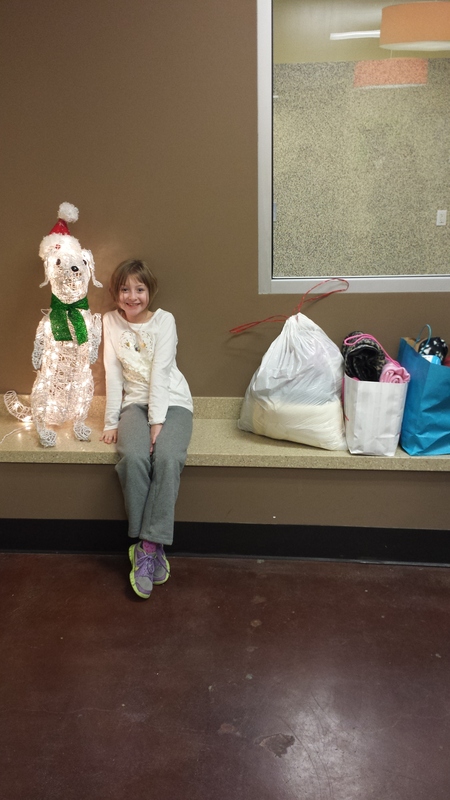 Jen Johnson’s ten-year-old Ava was so inspired by her experience at the Animal Heroes camp that she opted for donations for Great Plains SPCA instead of her presents at her party. Ava’s friends brought food, treats, toys and blankets for the animals at the shelter. Another story I loved so much that I had to share was about JLKCMO members stepping up to help on a snow day! MaryAnne Woirhaye led the way, as she couldn’t sleep thinking about all the kids who would miss their back snacks after a canceled packing shift at Headquarters. So she recruited some other Junior League members AND their kids. All the kids were just thrilled to be there, working with a lot of passion and enthusiasm to prepare the back snacks. Ocie delivered them to University Academy the next morning so that students could take them home for the weekend. It was a true team effort that made such a difference for so many. – Volunteer together! Find an opportunity for the whole family. Harvesters has some wonderful activities that everyone can participate in together. – Save! Whether it’s box tops for education or saving up that extra quarter each week to donate to a charity, your kids can see how little contributions can go a long way. Every $1 given to Harvesters allows them to provide three meals. – Donations instead! A big trend in children’s birthday parties is to ask for a small donation in lieu of a gift. Books and sports equipment are always in need at most urban schools in our community, and they are both items that kids like to pick out themselves – even if they are giving them away. Take Ava’s suggestion and ask for gifts for a local animal shelter or socks and underwear are always appreciated at Lazarus Ministry! – Talk about it! It may feel like it’s always rush rush rush when you are headed out the door to volunteer or attend a planning meeting. But taking the time to explain where you are headed to your kids helps them to see that you are making giving back to the community a priority. 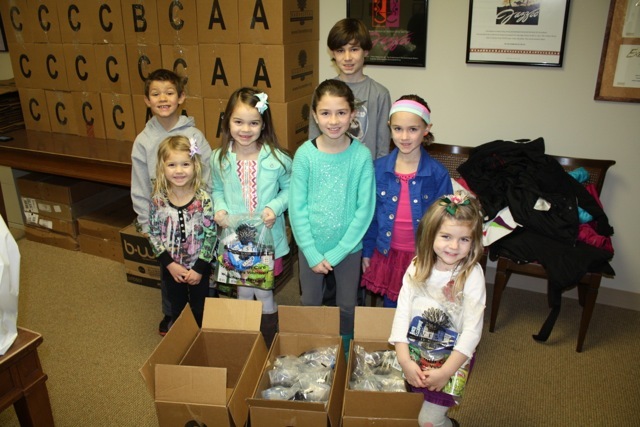 This entry was posted on January 20, 2015 by JLKCMO in Community Impact.